Use a big beautiful sound. Find a favorite simple melody, tune or scale and breathe a warm singing tone into your instrument. For flutists, playing a series of long, resonant, centered middle B naturals if always good. Feel the openness in your throat and facial cavity, the flexibility in your lips and the capacity of your breathing. Move on to descending ½ step pairs settling into your tone. Center and tune yourself with harmonic exercises and octaves slurs, etc… Gradually work your way into some fluid scales and arpeggios to warm up your fingers. Don’t race hysterically around on your piece or waste time trying to compete and/or impress others in the warm-up room. Stay centered and focused on yourself. Breathe, Breathe, Breathe! Tune carefully and with a full tone. It is meaningless to whisper out an “A”. If you have a chance to tune beforehand with the piano you will be using that day, then you will only need to play a quick check “A” when it is your turn. Otherwise, tune with your performance tone and give yourself a chance to blow out any “first-note” jitters, hear the piano and the room, breathe, and relax. You are about to have some fun. Remember to listen, listen, listen! You can make quick adjustments to your instrument during your longer rest periods in the piece if necessary. Learn about the intonation tendencies of your instrument (i.e. flute becomes sharp when excessively hot and flat when cold). Keep your instrument warm before playing. Tone should be a living expression, not a static “electronic” sound. Control, clarity and flexibility are all important ingredients to a beautiful tone. Vibrato should not be constant and unrelenting. It must vary in order to create a truly expressive phrase. Your color, size and intensity should help to create atmosphere, mood and expression. Too much vibrato is the same as no vibrato at all. Begin confidently and not apologetically. Project out over the heads of the audience and feel your sound bounce off that back wall. Better to begin perhaps a bit too fully than to choke out a tiny little blip. A good start will give you confidence and help you establish the flow. Using expressive and appropriate tone colors and dynamics will create an enchanting performance. Draw the listener into the subtle nuances and shadings of your tone. Study how to change the shape, size and direction of your air column (or whatever applies to your instrument) in order to create colorful and meaningful phrases. While complete articles can be written on each of these topics with more details, I will continue to give some basic tips and ideas on ideas for improving your performance, by improving your preparation. Rhythmic accuracy, accents, meter and precision are all very important. Your interpretation depends on your ability to first play what is written accurately. How precise and even are your eighth notes, sixteenth notes and triplets…and how steady are you keeping the rhythm throughout? Scales and technical studies are a must. They should be second nature and a fundamental building block for ease of technique in your solos. Do not learn your technique through your solos. Develop it fully in exercises designed for that purpose (refer to the “Creative Practice Section of Part I). It is much faster and more effective. Be patient and persistent. It will work! Many competitions require scale performance and those should be “easy” points for your overall score. Do not wait to start practicing those scales just for the festival/competition. However, if it is your first time and your very reason for working on the discipline of scales, then give it substantial time and attention. Be awake, alert and energetic when practicing. Set daily goals and play with a beautiful tone, slowly and accurately. Speed means nothing unless the sound is beautiful and even and the fingers are fluid and accurate. Command over these exercises will give extra confidence and security when you are in the stress and pressure of a performance. Finger Action: Geoffrey Gilbert (renown British flute master) would often request that we use “legato pianissimo” fingers. That is to say, fingers that move quickly upwards and land gently downwards. Fingers should always be smooth and even, never slapping and squeezing the keys. Mr. Gilbert also used to say, “Avoid black note fever!” Beautiful, full supported air is the key to success in the most technical passages. Tongue and fingers should always be “ppp”. Think legato and blow a full-bodied air supply. The notes will be full and not “pecky”. The tempo itself will shorten the notes. Imagine breathing in the word “HO” backwards to help limit the noise of shallow breaths. It will help open and relax your throat. Try not to “sip” cold air into the mouth. Breathe deeply and quickly and get it down low into your body and out of the way. The “sipping” action will also contribute to that familiar “cotton mouth” we can experience during performances. The ribcage should expand and remain lifted, not dropped. The head should be lifted as if by a puppet string pulling up from the top back of your head. This will help free your jaw for flexibility and control. This, in turn, helps to relax you. Do not jut the head forward or contort it in odd directions. Your eyes should glance down at the music while the head remains lifted. Practice good breathing exercises to develop endurance and comfort. Proper breathing is essential to all wind and brass players. Posture, position and balance of your instrument are all also crucial in keeping flexible and at ease in your performance. Breathe deeply and avoid squeezing your arms into your body. Open up the area around your torso and free your ribcage. Projection and power improve dramatically. Colors and tones will be greatly enhanced. Sustain fully through the last note of the phrase. Plan your breaths and mark them in your part. Don’t leave it up to chance. You will end up taking more than necessary, grabbing them haphazardly and disturbing the phrase. The breath is part of the expression. Many competitions and auditions require sight-reading. Sight-read every day (new solos, etudes, band parts…). Good sight-readers do it often! You must read through with the dynamics the first time. Remember to see the dynamics and articulations at the same time as you see the notes. See it as a whole. Look out for those key changes and time signature changes. Correct notes and rhythms are important, but maintaining pulse, not losing a beat and keeping a sense of phrasing, dynamics and style will create a successful read. An occasional wrong note is not important if you communicate the overall intentions of the piece well. Choose pieces with the advice of your private teacher or band director. You can also access professional organizations (i.e. the National Flute Association) and libraries for listings and grade levels of pieces. Show what you can do well and do not choose pieces that will demonstrate your weaknesses. Challenge yourself and allow adequate time to prepare. With limited time, choose wisely. Better to pull off a simpler piece with great musicianship and personality than to stumble and trip your way through a more demanding work. Bring the composers markings to life. That is your role as the performer and interpreter. First and foremost, follow the directions on the music well. If few are given (as in Baroque music) then seek out good editions and advice from teachers. Also read up on performance practices of that particular period. A Bach Sonata is not performed in the same way as a French Conservatoire Piece. Know what is appropriate and desired. Play the music, not your instrument. It is the medium through which you are communicating. Who is the composer? When did he live? What period and style is the composition written? Listen to recordings and listen to other works of this composer. Bring the composer’s intentions to life. That is what interpretation is, not what you think it should be. You have something to say with your piece. Figure out what that is, work to communicate it through the music and create a relationship with the listeners. That is the magic of music. You can say things that words or pictures cannot. Explore and have fun finding your way of doing that. Phrasing is the art of shaping a melody. It is the ability to create a rise and fall or a tension and release as the phrase flows forward. Think of the melody traveling over the bar-lines. Your music must have a dynamic shape and flow otherwise; it is merely a mechanical exercise. Know your piano part. It is essential to the understanding and interpretation of the piece. It isn’t a last minute addition. Most of the time, students are limited by time and money for rehearsals with their accompanist, so listen to recordings and study the piano part. You need to know it well and understand how your part works with it. Also, know the other parts of your ensemble. You fit together like puzzle pieces. You certainly don’t want to sound like individuals who start and finish together, but essentially played separately. Practice often, practice scales and intonation exercises together. Learn to blend with each other’s sounds and work to create a unified interpretation and presentation. Plan your breaths to benefit the overall ensemble line. Never tell us with your facial expression or body language that something went wrong. Don’t forget to wear your smile. You are happy to be offering your performance, no matter where or when. Be positive and make it your best. Let your hard work be the firm ground you can plant your feet in and the music will flow. Stand away from your stand and place the stand so that its top edge is no higher than your shoulders. Your audience (or judge) wants to see your lovely face and hear your sound project out and over the stand. Never hide behind the stand. As with everything else I mention in this article, this all must be practiced before your performance. Excessive body movements are unnecessary and often very distracting. In general, the expression of musical emotions should be created solely by your sound and not visually by your body. At the student level, the “choreography” (dancing about) is not only distracting but also very often detrimental to your overall control. Tape yourself and listen to hear if your interpretation of the composition is coming through or is it dependent on the “dancing”. Video tape yourself as well and watch to see if your movements are too excessive. Ensemble groups should seek advice as to the position and setup of each player. The proper stand placement and sharing of music parts, the correct order of the parts and the physical shape/setup will help to create the best ensemble sound and visibility among players. Do not forget to practice bowing as a soloist as well as together with your ensemble. Go slowly and acknowledge your pianist. Dress: Look the part of a performer. The type of performance (concert, audition, competition), time of day and the kind of audience will dictate the formality or informality of your dress. One should not be over-dressed or over-made-up for an audition or competition. You should be comfortable and have ease of movement. You are offering something special and therefore, should look respectable (not overly trendy either), neat and clean. Have respect for yourself as a performer and respect for your audience and or judge. Keep it simple, elegant and comfortable. On a side note, don’t forget to sleep and eat well before your performance dates. If you are not fresh and nourished, you may not have the energy to concentrate and give your best performance. Savor each moment of your performance and try to get your ego out of the way. Enjoy the privilege and pleasure of giving the gift of music to the world. Every performance, no matter how big or small, long-planned for or spontaneous is an opportunity to discover music and who you are as a musician. Be positive and have fun! This spirit of positive thinking is a must. You are the best person to be playing this piece at this moment – now make it so! A native of Detroit, Johanna Beth Sennett, began her flute studies with Shaul Ben-Meir of the Detroit Symphony. She graduated with “Special Distinction” in flute performance from Northwestern University’s School of Music, studying under Walfrid Kujala of the Chicago Symphony Orchestra. Among other distinctions, she received the Ruby Sword of Honor from Sigma Alpha Iota Honorary Music Fraternity. Further training includes studies in Paris with Michel Debost of the Paris Conservatoire and the Nationale Orchestre de Paris. 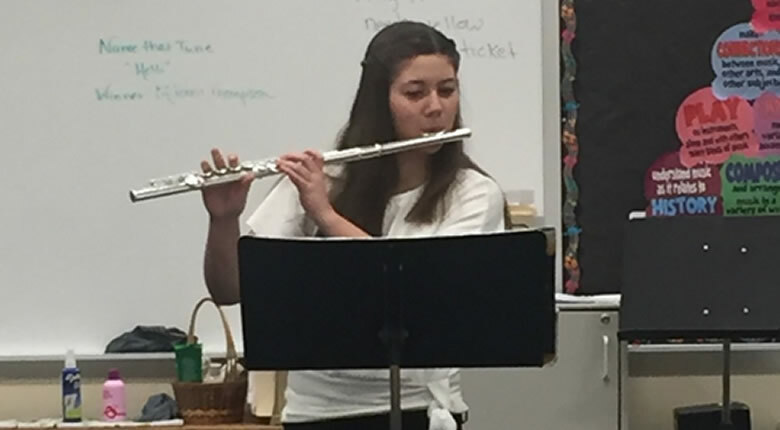 Ms. Sennett concluded her studies with renowned British flutist, Geoffrey Gilbert whose students included, James Galway and William Bennett. She returned to Detroit in 1988 at which time she founded and directed the first season of Kaleidoscope Concerts. Kaleidoscope Concerts, Inc. grew out of a desire to celebrate the diversity, value and spirit of chamber music. The series came to be known for its unique and intimate programs with entertaining and educational commentary. She was also featured in Metropolitan Woman Magazine in an article about women impresarios. Ms. Sennett performed extensively as a soloist, chamber musician, orchestral flutist and commercial recording flutist, including regular substitute performances with the Detroit Symphony Orchestra, the Flint Symphony and the Michigan Opera Theater Orchestra. She maintained a large private teaching studio in the Detroit area and taught joint master classes with Jeffery Zook and Philip Dikeman of the Detroit Symphony. She also served as a judge for the National Flute Association’s High School Flute Competition. Beth Sennett recently moved to the Chicago area with her husband and three children and is performing as well as teaching master classes and private lessons.